North Korea has successfully conducted a test of a nuclear bomb that is meant to be loaded into an intercontinental ballistic missile. North Korea’s nuclear test site. The TV anchor said North Korea’s leader Kim Jong Un ordered the test. South Korea’s presidential office said the security chiefs for Seoul and Washington have spoken following North Korea’s sixth nuclear test. A spokesman said US National Security Adviser HR McMaster spoke with his South Korean counterpart, Chung Eui-yong, for 20 minutes in an emergency phone call about an hour after the detonation. South Korea’s weather agency estimated the nuclear blast yield of the presumed test was between 50 and 60 kilotons, or five to six times stronger than North Korea’s fifth test in September 2016. That would mark a significant step forward in the North’s quest for a viable nuclear missile capable of striking anywhere in the United States. On North Korean television, a newsreader called the test a “complete success” and said the “two-stage thermonuclear weapon” had “unprecedented” strength. Hours earlier, Pyongyang claimed its leader had inspected a hydrogen bomb meant for a new intercontinental ballistic missile. Seoul’s weather agency and the Joint Chiefs of Staff said an artificial 5.7 magnitude quake occurred at 12.29pm local time, in Kilju, northern Hamgyong province, the site where North Korea has conducted nuclear tests in the past. Japan confirmed that North Korea conducted a nuclear test, Foreign Minister Taro Kono said. “It is absolutely unacceptable if North Korea did force another nuclear test, and we must protest strongly,” Prime Minister Shinzo Abe said. North Korea conducted two nuclear tests last year, the last nearly a year ago, on the September 9 anniversary of the nation’s founding. It has since maintained a fast pace in weapons tests, including its first two intercontinental ballistic missiles test in July. Last month, North Korea fired a potentially nuclear-capable mid-range missile over northern Japan. 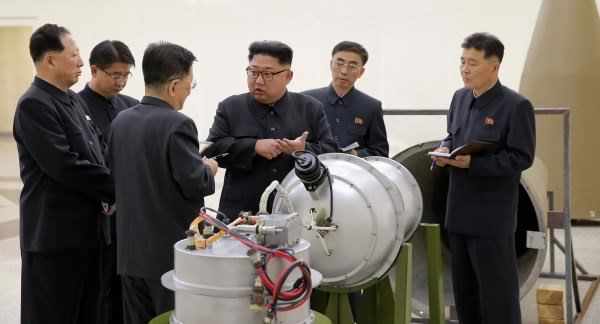 Earlier on Sunday, photos released by the North Korean government showed Kim talking with his lieutenants as he observed a device that was apparently the thermonuclear weapon destined for an ICBM. Another photo showed a diagram on the wall behind Kim of a bomb mounted inside a cone. State media said Kim visited the Nuclear Weapons Institute and inspected a “homemade” H-bomb with “super explosive power” that “is adjustable from tens (of) kiloton to hundreds (of) kiloton”. North Korea’s nuclear and missile programme has made huge strides since Kim rose to power following his father’s death in late 2011. The North followed its two tests of Hwasong-14 ICBMs by threatening in August to launch a salvo of its Hwasong-12 intermediate range missiles toward the US Pacific island territory of Guam. It flew a Hwasong-12 over northern Japan last week, the first such overflight by a missile capable of carrying nukes, in a launch Kim described as a “meaningful prelude” to containing Guam, the home of major US military facilities, and more ballistic missile tests targeting the Pacific. It may be difficult for outside experts to confirm that the nuclear device detonated Sunday was an H-bomb. State media reported that the test left no trace of radioactive material. The US and its allies attempt to detect blast material to gauge North Korea’s progress, but Pyongyang has become better at containing it as its nuclear programme has evolved.